Outside the Charger Forums we also work with customers that have very high performance engines. The Racing Fuel is $9.00 per gallon. The 91 was $3.80 per gallon and adding ACES IV made the total price $4.152 per gallon. The ACES IV produced 2.2 hp and 7.1 torque MORE than the racing fuel! It also produced 8.5 more hp and 15.4 torque MORE than the 91 octane alone! 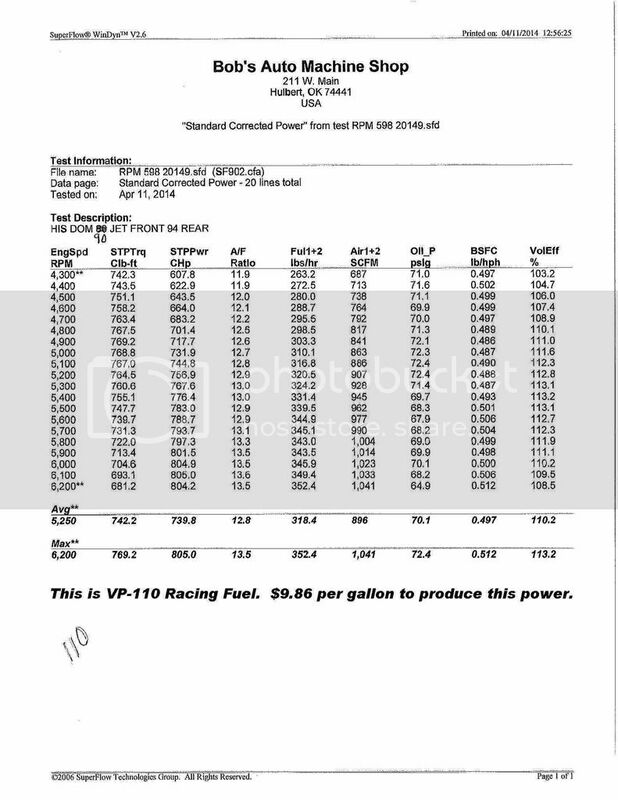 So using 91 and ACES IV in this case would produce more power, more torque and save $4.848 per gallon doing it (53.9% less than racing fuel). Entitled to your own opinions but not entitled to your own facts! Last edited by 370 HEMI; 01-11-2017 at 08:19 PM. Damn this awesome info(spectacular and probably mind blowing to those guys at the shop) made me miss this pale redhead i was checking out, yum! How about some more information that would apply, like both dynamic and static compression. Lower octane making more power is nothing new if the compression isn't there to support race fuel. But the 110 octane made more power than the straight 91 octane did. It was only when Aces was added that the lower octane produced more power than the 110 octane did. That's much different than the engine not being able to support the higher octane. If it couldn't, the 110 octane wouldn't have made more power than the straight 91 octane did. It also wouldn't explain how the Aces added that much additional power over the straight 91 octane. There's a long way between 91 oct and 110. Also what 110 was it ? Leaded , unleaded , oxygenated? Justcause Iit made less power on pump doesn't disprove my statement. 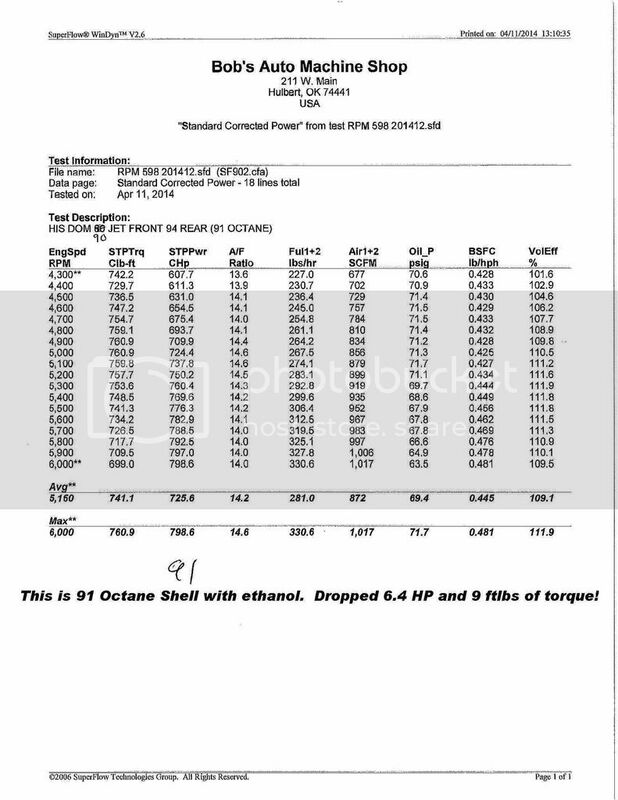 Aftermarket additives such as Torco will raise 91 octane to 100 when mixed right.Also just to clsrify.....we are talking less than 10 hp between the lowest pull on 91 and the highest on aces. If you can only gain 10 hp on fuel you don't need race gas. Last edited by Hemi31; 04-20-2014 at 07:23 AM. I will find out the static and dynamic compression on the engine from him and also what 110 it was as a baseline. But SERIOUSLY......Torco does NOT raise octane 9 full octane points. Only tetraethyl or tetramethyl lead can do that! Torco may raise it 1 full octane point with the Manganese. ACES IV doesn't raise octane in that fashion either! It is how it functions at peak heat release that makes the difference WHILE lubricating the cylinders and allowing for reduced friction and wear. People on this forum search for 10 hp and 8 ft lbs of torque and spend a lot more than what ACES IV costs per gallon. Give some credit where it is due. Just because you don't like us shouldn't get you so upset. Hey, we offered to have you come and prove it to yourself a few years ago when Cherry invited you to Big Shot Dyno in Tallmadge and bring your car and you refused to do so! Actually yes Torco will raise octane that much. 32oz into 5 gallons gas is the mix.....ah crap you were right....it doesn't raise it 9, it raises it 14. And Brian contrary to what you might believe I have tried your stuff. When you were giving it away like water at the 2009 LX&B at Quaker City. It did absolutely nothing and I actually saw a decrease in mileage. Last edited by Hemi31; 04-20-2014 at 08:07 AM. With all due respect, A IV isn't going to lubricate cylinders. And even if you could come up with the physics to suggest it does, magical anti frictional compound isn't going to account for anything measurable. 10 HP is nothing. Outside air temp and barometric pressure could account for that much change, just by themselves. Hemi31 is absolutely correct, racing fuel should have resulted in a much much larger HP change over 91 octane. MMT is the additive in these off the shelf boosters. MMT (Methyl cyclopentadienyl manganese tricarbonyl) is a metal that doesn't burn but plate in the cylinders leaving your plugs impossible to read and also leaves the residue to polish your cylinders. You would get the same effect on your cylinders by pouring jewlers rouge in the intake! But for the sake of discussion, lets just assume it does do what you say. As many chemists know, these products have a diminishing effect on higher-octane fuels. Adding the same product to 87-octane pump gas will produce a lot more gain than adding a bottle to 91-octane premium. Too much of MMT will also damage emissions-control hardware, including spark plugs, injectors, up stream and down stream oxygen sensors and converters. This is why off-the-shelf additives have an emissions component safe formula and an off-road formula due to the concentration of MMT. Anyone who uses these additives really have is no point in using them in 87octane gas. The street version octane booster from your local parts store is a waste of time. Now, using your example of 32 oz in 5 gallons to get 105 octane fuel with pump gas it is $20.95. $20.95 div by 5 = $4.19 per gallon. So 1 tank of Torco that damages the every day car would cost you an extra $80.45 to get 105 octane!!! Wow and ACES IV did it for $6.76 PER TANK!!! 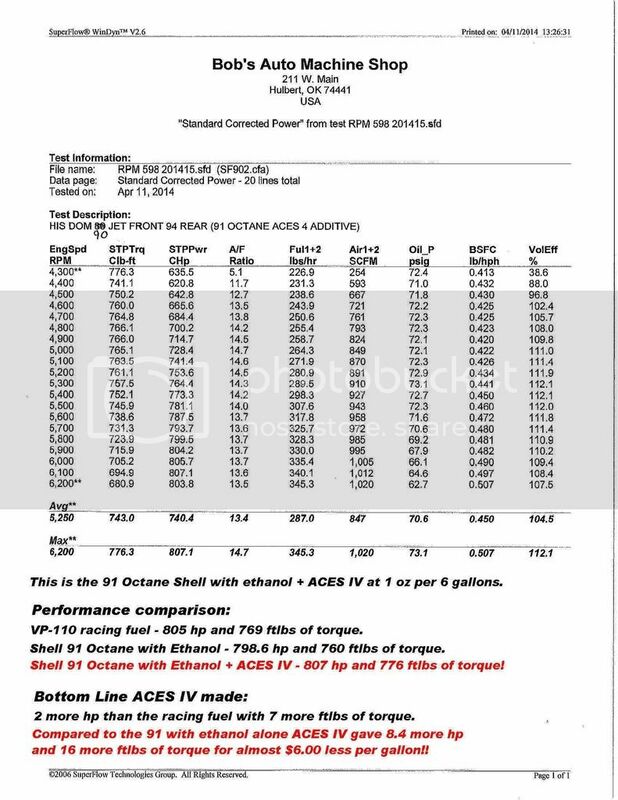 So your Torco would treat one tank and the same price for the Torco would treat 11.9 tanks of gasoline using ACES IV!! So putting it another way, 192 gallons of ACES treated fuel is $67.60. 192 gallons of Torco treated fuel is $804.48. 1 gallon of ACES IV treats 770 gallons for $234.00 770 gallons of torco would be $3226.30. Anyone can see my point here! The 598 by the way was 11.1 to 1 and the 110 was VP-110 leaded not oxygenated. So it did have the compression ratio to translate the race fuel and the street fuel. As far as you using ACES IV, 1 eight oz bottle would start to clean your fuel system and your engine! If you are running the fuel trim fatter and you add ACES IV to it, it won't appear to do anything and actually hamper your economy both from being too rich and also from dropping carbon deposits into the mixture as well. We all know extra carbon hampers combustion. We offered you an opportunity to openly bring your tuner and put your car on the dyno, add ACES IV and the dyno would prove it or disprove it with a 3rd party dynojet operator to be the referee.......FOR FREE! Again, you refused! And he lives so close, id understand halfway cross country but same area?